Elephant Lodge guests stay in luxury Knysna Elephant Park accommodation from where they can hear and observe the sleep routines of these gentle giants. Knysna Elephant Park accommodation offers 6 en-suite rooms in the same building as the Elephant sleeping quarters as well as comfortable group rooms in the education centre. The orphaned Elephant make their way to the first class sleeping boma (enclosure) at the end of the day, where they enjoy rest and relaxation in comfort with lots of soft sawdust and branches for their night-time meal. 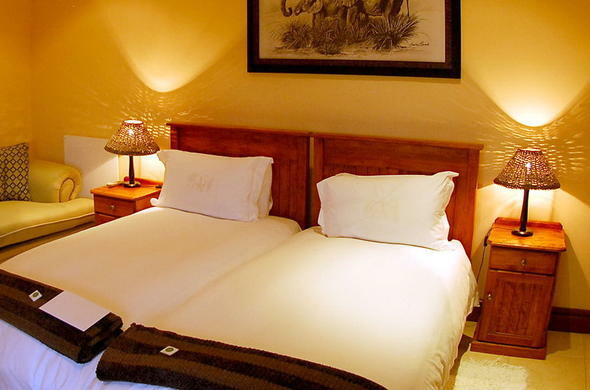 This Knysna Elephant Park accommodation is very spacious with en-suite facilities and Elephant themes throughout. Room types include Luxury Rooms, Standard Rooms and a Family Unit. There are 6 elegant suites which have been built within the night-time boma of these amazing animals and the central lounge overlooks the Elephant sleeping quarters. This unique arrangement affords special insights and memories to last a lifetime. Children are welcome at Elephant Lodge. Share your Garden Route accommodation with African Elephants at the Elephant Lodge near Knysna. The lodge is built around the special Boma where the orphaned Elephants sleep at night. All six en-suite rooms at the Elephant Lodge, Knysna Elephant Park are decorated in an Elephant theme. Enjoy the views over the Elephant's sleeping quarters from the central relaxation area.